"Tanny had a quality about her that made me think of a young animal coming into its own, like a gauche young colt soon to become graceful thoroughbred." American Masters – Tanaquil Le Clercq: Afternoon of a Faun shows Le Clercq (Tanny) performing with George Balanchine’s New York City Ballet in some of his most memorable ballets, including The Four Temperaments, Symphony in C, La Valse and Western Symphony, and in Jerome Robbins’ Afternoon of a Faun. We also see Tanny and Jacques d’Amboise rehearsing George Balanchine’s The Nutcracker, for which Tanny was the original Dewdrop. Tanny began her career at the prestigious company as a soloist at the age of 15. Learn about the New York City Ballet repertoire and dancers’ admiration for Tannny. This is the ballet for which American Masters — Tanquil Le Clercq: Afternoon of a Faun is named. Jerome Robbins choreographed the pas de deux for Tanny, with whom he shared a deep friendship. Any romantic feelings they may have had for each other had no outlet since Tanny was devoted to George Balanchine, whom she married in 1952. In written correspondence, Robbins refers to both Tanny’s physicality and her feminine allure. “Tanny had a quality about her that made me think of a young animal coming into its own, like a gauche young colt soon to become graceful thoroughbred,” wrote Robbins. Later in her life, Tanny admitted her insecurity when she saw a revised version of the ballet, wondering whether Balanchine made changes because he didn’t like the way she had performed the steps. 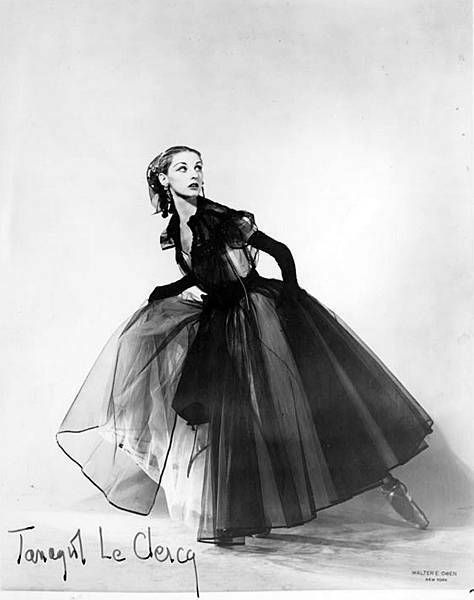 Tanaquil Le Clercq in La Valse. Photo taken in 1951 by Walter E. Owen (1896-1963). The waltz rhythms of Ravel’s La Valse sets Balanchine’s choreography in motion. According to the New York City Ballet website, the mood of the ballet is “superficial gaiety mixed with an uncertain feeling of impending catastrophe.” In the film’s archival footage, Tanny dances the soloist role of a woman who is seduced by the figure of death before falling lifeless to the floor. Depicting the Old Wild West in music and costume, Balanchine’s “American” dance uses traditional ballet vocabulary but adds gestures of American folk dance. In American Masters — Tanaquil Le Clercq: Afternoon of a Faun, we see Tanny performing Western Symphony with Jacques d’Amboise​. This ballet and Afternoon of a Faun were two of the last dances d’Amboise performed on tour with Tanny before she fell ill. In the film, fellow New York City Ballet dancer Arthur Mitchell describes his own last night performing Western Symphony with Tanny in Copenhagen, hours before polio would paralyze her.